Portable Class Library for easy integration into own projects. New Social Network tag class to format Twitter, Facebook, Skype, Foursquare etc. tags. New Geo Record class that stores latitude and longitude of geo coordinates (gps coordinates) in a chosen format / URI scheme. New geo web redirection script that checks the client’s user agent, and redirects it to the most appropriate way to show the geo coordinates on the device (opens maps app using different URI schemes or uses a web-based maps version). New Smart URI class that always uses the most efficient record type to represent itself, to save bytes on the NFC Tag: either a simple and small URI record, or Smart Poster if any Sp-only information is added (like titles). New SMS record class, which enables easily creating SMS records by simply specifying the telephone number and the message body. The packaging as a portable library is a major change and big step towards the upcoming first beta release. You can now directly include the library into any Windows 8 platform project. 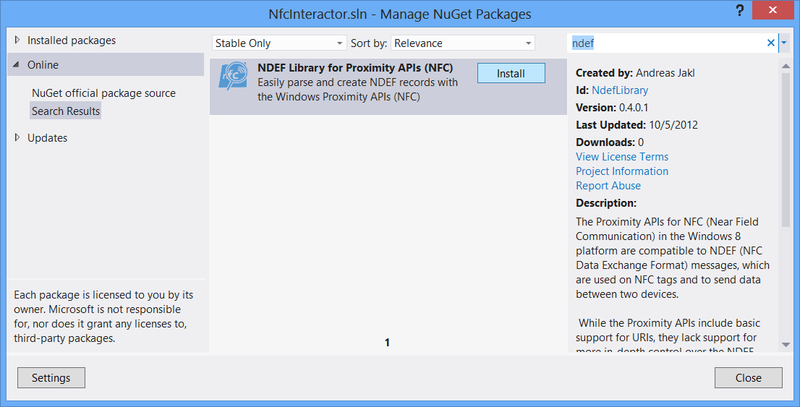 Loading the library is completely automated and 100% pain-free, thanks to the NuGet package manager in Visual Studio, which downloads + references the library with just one click! The screenshot below summarizes how easy it is; the project wiki includes complete setup instructions.